Details of Experimental Design can have a negative impact on Innovation Productivity. The stability of radiolabelled reference standards, widely used for binding assays in initial selection of drug candidates, belongs in this category. A re-testing campaign with a binding assay generated strange results. The reproducibility of the assay was far from the expected range. Clearly, such a finding should not be ignored by drug discovery units. Root cause analysis identified the reason for the observed irreproducibility. The labelled reference standard showed significant chemical decomposition. Actually not a real surprise, since the energy entry from radio processes is higher than the energy of chemical bonds, resulting in destruction of chemical structures. In a couple of months, a highly pure reference standard can loose 10% of chemical purity. 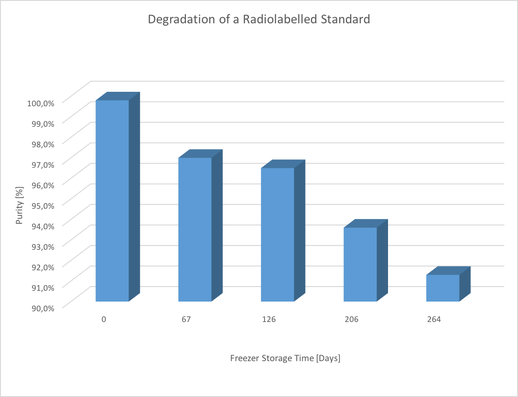 In rare cases when volatile cleavage products carrying the radiolabel are formed, an overall loss of radioactivity will indicate the decomposition process. In all other cases, the resulting structure mix still contains the complete amount of radioactivity but will not bind with the required receptor selectivity when used in an assay. The assay results generated with such a compound mixture are neither reproducible nor useful for productive drug discovery processes. Over time the assay results will change significantly, thus having a negative impact on the reliability of the emerging SAR. To make matters worse, at a certain level of impurity, the reference standard is likely to enter the “catastrophic decomposition” process, ending in an unclear mix of products and fragments, containing close to 0% if the expected structure. The potential impact on Innovation Productivity is significant and originates in the undetected erosion of a core process – generation of SAR (structure activity relationship). Due to the decomposition of the reference standard, assay results will sooner or later fail to be reliable enough for SAR.